It is with sadness and a heavy heart that I accept the news of Demi and Ashton's divorce. I always liked them as a couple. 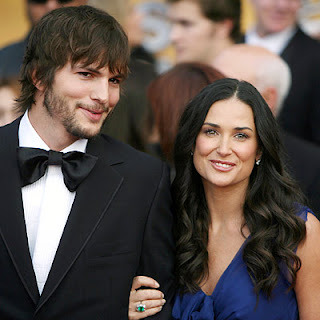 For so long they defyed the odds - not only the May-Dec thing or the fact that you can't look at Kutcher without seeing him as Kelso, but they seemed to work out the fact that Demi was living a less Hollywood existence and Ashton was smack in the middle of it. I love that he was able to find his role with her daughters and with Bruce. But most of all, there was always something so genuine about their enjoyment of each other. On the other hand, although Demi's ability to be ageless is uncanny; unless she's taken a page out of Oscar Wilde's novel and has a horribly disfiguring, aging portrait of herself hidden somewhere, then eventually she and Ashton would have looked like George Sr. and Barbara Bush did back in the day. So perhaps she's smart to get out now before they look like mother and son. Wishing them both a relatively painless divorce.